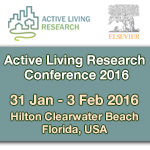 ALR2016 was held January 31 - February 3, 2016 at the Hilton Clearwater Beach, Florida. The Active Living Research Annual Conference brings together active living researchers and champions from over 30 disciplines to advance knowledge and action around active communities. The 2016 conference theme, Equity in Active Living, explored opportunities to ensure that all people, regardless of race, ethnicity, economic background, level of education, age, sexual orientation, gender identify, physical and/or cognitive ability, have access to safe and enjoyable places to be physically active. The conference is the premier venue for both cutting-edge research and for making findings useable by non-scientists. The conference agenda featured two focus areas: research and practice/policy. Integrating two focus areas provided opportunities for exchange on how to use evidence to increase physical activity in many settings, identify new policy-relevant research questions, and develop new collaborations across sectors. The program was comprised of approximately two-thirds research-oriented and one-third practice/policy-oriented presentations, with some overlap. A unique feature of ALR2016 was our commitment to creating an active conference. We went beyond the rhetoric on active living to incorporate opportunities for physical activity directly into the conference program. The 2016 Conference was a new partnership with Elsevier. A select number of papers presented at the 2016 conference are available for free in the February 2017 Supplement Issue of Preventive Medicine.